Download Criminial in Digital HD from the iTunes store. Criminial images are © Summit Entertainment. All Rights Reserved. If you look up the word criminal in the Merriam-Webster dictionary, you will find an adjective meaning "involving illegal activity: morally wrong". From this, one would ascertain a movie with the word as its title would involve either of the above mentioned descriptions, which it does. However, it's difficult to figure out which character(s) the title is alluding to. 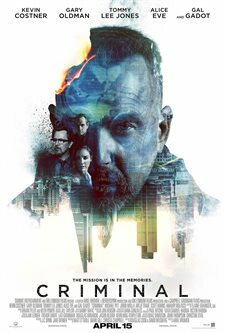 Criminal is a very nondescript title for a somewhat interesting film, and that is only the first of a few of the problems plaguing Director Ariel Vromen's (The Iceman) newest release. The script isn't as intriguing as it could be and none of the characters are very well fleshed out, which leads the audience to be uninvested in their well being. William "Bill/Billy" Pope (Ryan Reynolds; Deadpool) is a CIA agent protecting a dark web mastermind, The Dutchman (Michael Pitt; Boardwalk Empire). Unfortunately, some not so nice people are looking for the Dutchman and Kill Pope in an effort to find him. With Pope dead, the CIA are desperate to find the Dutchman and his deadly program before it gets into the wrong hands. Dr. Franks (Tommy Lee Jones) is a neurosurgeon experimenting on memory transfer in lab rats. When the CIA seek him out to perform his technique on a human he suggests the perfect candidate to receive Pope's memories. Jericho Stewart (Kevin Costner; Dances with Wolves) is a maximum-security criminal who, because of a traumatic brain injury as a child, can't reason between right and wrong and feels no emotions. He is the blank canvas Franks needs, but when he starts remembering Pope's memories it alters him in a way he is unprepared for. I'm not sure if Costner's graveling voice is a purposeful character trait or his normal speaking voice nowadays, but whichever it is, it's annoying. I wanted to give him a throat lozenge the entire film. Gary Oldman (Harry Potter and the Prisoner of Azkaban), as CIA supervisor Quaker Wells, is mediocre. The script wastes his talent. Jones fairs slightly better, but, even so, there wasn't much he could do with the screenplay. Even Gal Gadot (Fast & Furious 6) didn't stand out in any way, unlike her other recent role as Wonder Woman. As many movies are these days, I found moments to be extremely violent; but, I suppose that was to accentuate Jericho's unfeeling nature. There were also a few humorous moments, but, with a story such as this one, I felt there could have been more. There were also unintentionally cheesy moments that fell flat. The concept is unique enough to have a lot of potential, but the script let the whole movie down. There isn't enough emotional investment for the audience to care and I left wanting more, but not in a good way. This is one case where 20-30 minutes more would have benefitted the film, as the Director could have used the extra time to give us more insight into a few of the characters. Perhaps, with the additional information, it would have been a more heartwarming movie.